As some of you may recall from my Banoffee Pie back in January, it’s my absolute FAVORITE dessert! I love my cupcakes and I enjoy a good creme brulee, but put a Banoffee Pie in front of me and I’m not likely to share any of it… it’s all mine ya hear? 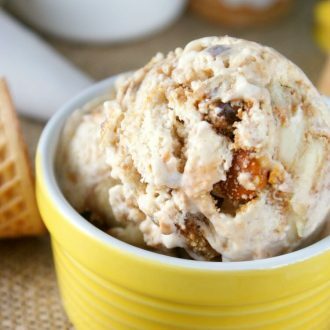 I decided to experiment with this beloved dessert of mine and give it a summer twist: Ice Cream. 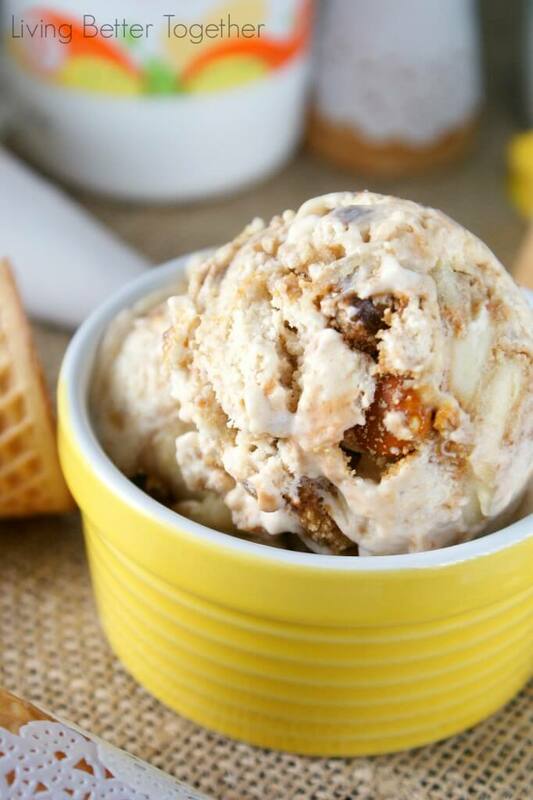 Yup, that’s right, Banoffee Pie Ice Cream, and it might just be better than the pie itself! Crazy I know… but this is some seriously awesome stuff! In case you’re wondering what Banoffee Pie is to begin with, it’s okay, most people have never even heard of this English dessert. Banoffee come from it’s two main ingredients, banana and toffee, then you add graham crackers and chocolate and whipped cream and we’re talking about something absolutely heavenly! Are you guys getting how much I love my Banoffee Pie yet? 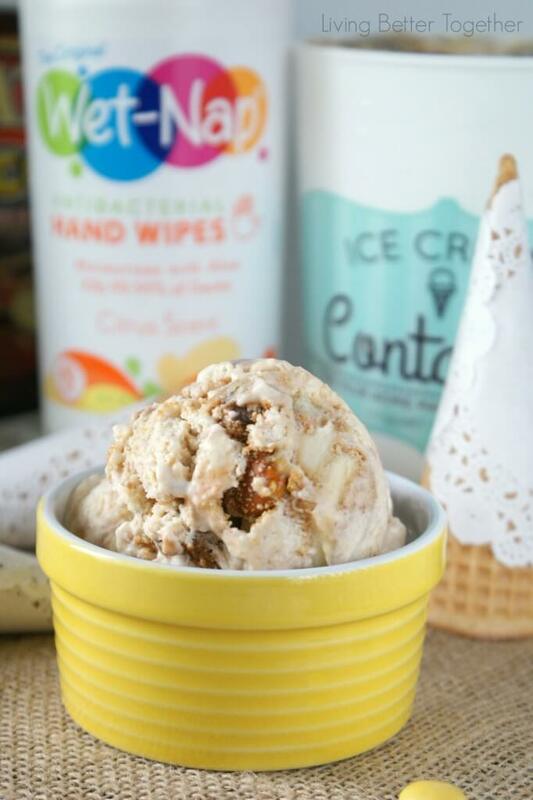 Did I mention that I caramelized the bananas in this ice cream? Yup, they’re pure bliss, just sayin’! So I’ve already told you what the best part about this ice cream is, the flavor, but the second best thing is that there’s no churning or shaking or weird equipment involved. See, why would you want to go out for ice cream when you can make your own right at home? However, just because it’s easy, doesn’t mean it isn’t still messy. I’m not sure how but I never seem to be able to walk away from a recipe without half of it on me and I can never eat ice cream faster than it wants to run down my arm. I know I can’t be alone here. Thankfully I had picked up a container of Wet-Nap to help me keep my mess under control. When it comes to ice cream, a basic napkin just doesn’t get the job done, it still leaves me feeling sticky. 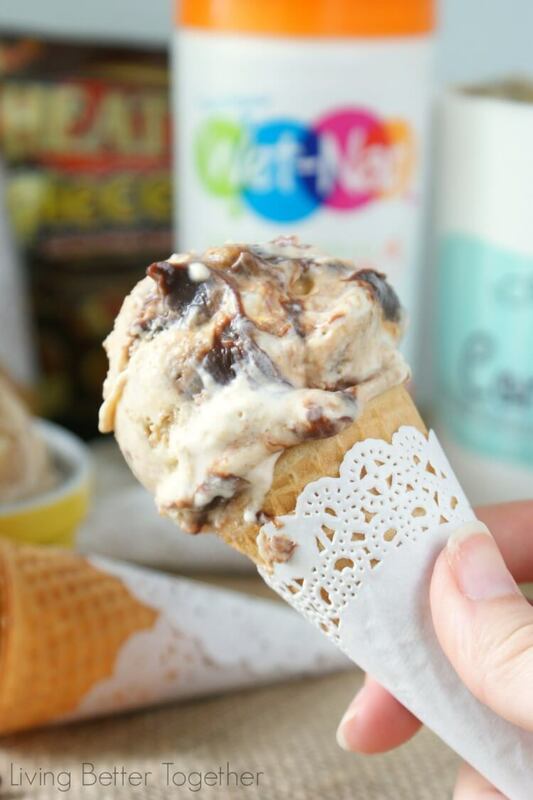 With a Wet-Nap you get a cloth that’s softer and moisturizes your skin with aloe vera which means you can make and enjoy your ice cream without feeling like a sticky mess! I also love how strong they are because one Wet-Nap does the jobs of several napkins so I can wipe off my hands and then wipe down the counter. 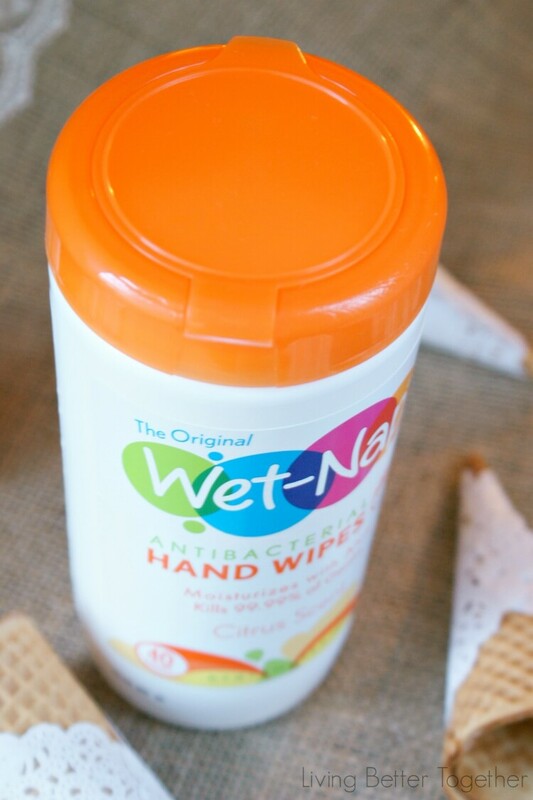 Wet-Nap are perfect for all of your summer activities, grab them in the napkin aisle at Walmart. And as if Walmart’s everyday low prices weren’t great enough, I’ve got a coupon to save you an extra $.55 off one Wet-Nap product! So now that I’ve teased you with all of this delicious talk and we’ve got a plan of attack for cleaning up our mess, how about that recipe, shall we? A favorite English dessert gets a summertime makeover! In a large bowl or stand mixer, whip heavy cream until stiff peaks form. Fold in sweetened condensed milk. Slice up bananas and add to a skillet with a little butter and the brown sugar. Stir them around over medium heat for about 3-4 minutes. Add graham crackers to a food processor or blender and pulse until they're just fine crumbs. Stir graham crackers crumbs and Heath Pieces into whipped cream mix. Pour into two quart sized containers and evenly swirl in hot fudge and caramel sauce. Place in the freezer to chill for at least 6 hours before serving. 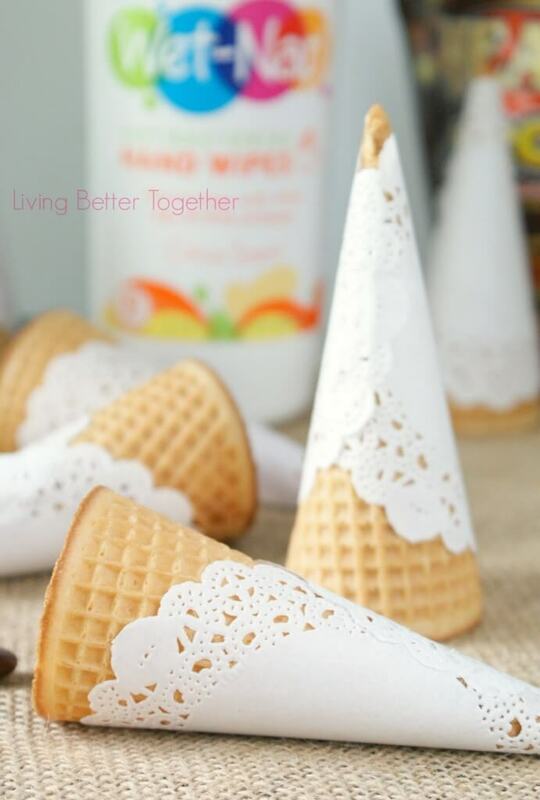 So you wanna know how to make your ice cream cones look all cute with doilies like mine? It’s really easy! Squeeze a small line or dots of edible glue on the lower portion of your cone and adhere one edge of the doily, make sure your doily is high enough up so it doesn’t shoot over the tip of the cone. Add a little more glue to the edge you just glue down and wrap the other edge around to adhere. 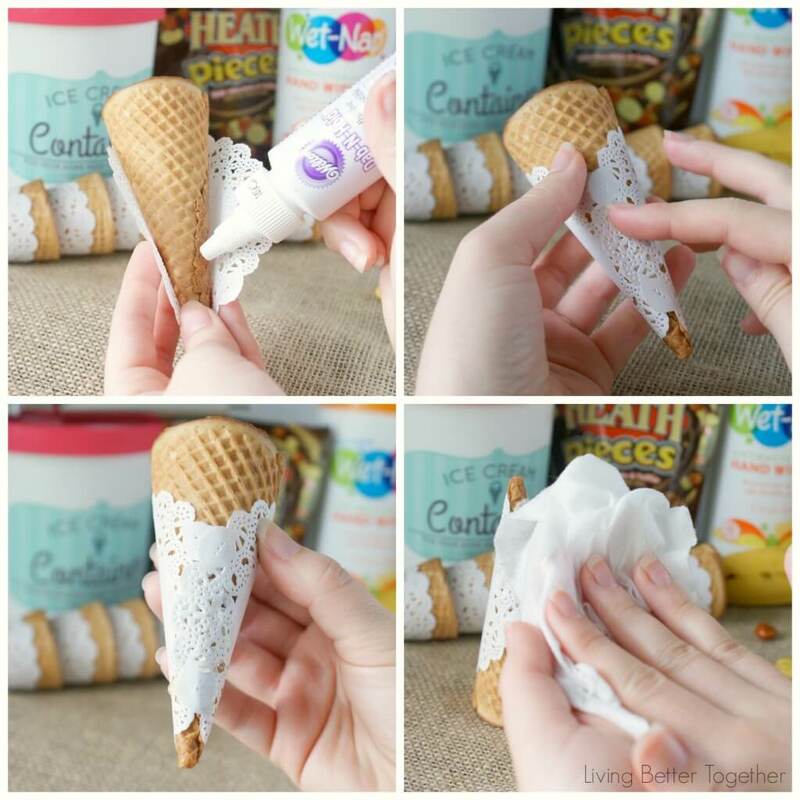 Set on wax paper to try for a few minutes and wipe any excess glue off your fingers with a Wet-Nap. See now you have beautifully wrapped ice cream cones. These are the perfect way to add a little detail to an ice cream bar at a bridal shower or birthday party or even just for yourself! Don’t forget to pair it with this killer ice cream… you won’t be sorry. Promise! What messes will Wet-Nap be helping you clean up this summer? I have never tried a banoffee pie and now I can’t wait to. 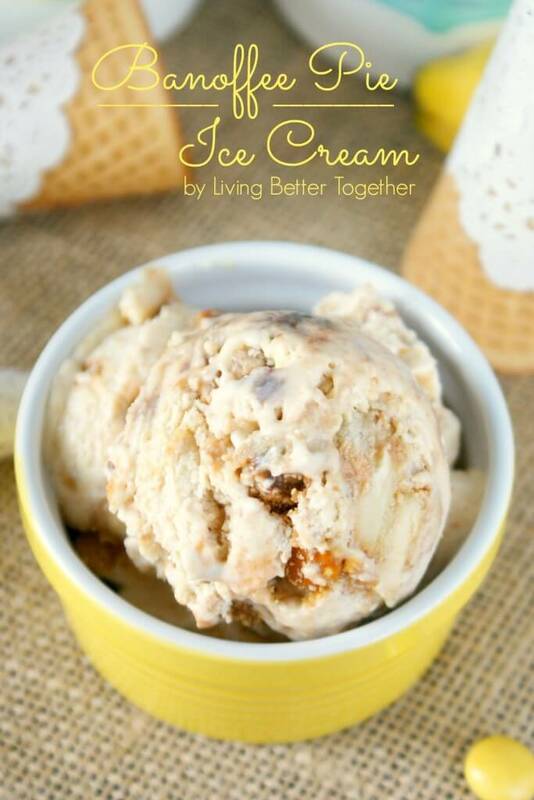 This ice cream DOES sound heavenly! You are totally missing out girl, you’ve got to get your hands on a slice asap! What a yummy looking ice cream! Love all the big chunks of caramel and banana! Banoffee pie is one of my favourite treats so I am loving this. It really is the best thing ever! Thanks so much for stopping by and I hope you get a chance to make this real soon! Are you kidding me right now? That sounds like the best pie EVER. I LOVE toffee. I am pinning this to try later for sure!!! yum!! Pinned to try this recipe!! Thank you, Jillian! It was absolutely delicious! Amazing! I eat Banofee just as a pie. But an ice cream? Interesting. Well, the Wet Nap adds thrill to this one,hun?! I love how they turn out. This is something very special and tasty. Thank you so much for this amazing blog.